Last week tested our faith, our resolve as a nation, and our commitment to one another. I’m so proud to see how America has responded to these trials. So this article is dedicated to all the first responders, emergency personnel, law enforcement officers and even everyday Americans who rushed toward danger last week, and to all those who do so every week with very little fanfare. A week ago, two men carried out a terrorist attack on U.S. soil. Three people died that day: eight year old Martin Richard, 23 year old Lingzi Lu and 29 year old Krystle Campbell. Another 219 people were treated for injuries, according to the Massachusetts Hospital Association. On Thursday, another life was taken when MIT Patrol Officer Sean Collier was murdered by the suspects. On Tuesday, while the nation was still reeling from the Boston bombings, screeners intercepted poisoned mail sent to Senator Roger Wicker and President Obama. Then on Wednesday, tragedy struck much closer to home in West, Texas. 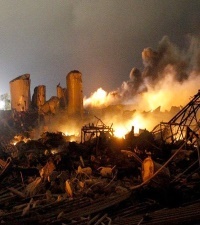 An explosion at a fertilizer plant killed 14 people, injured 200 more, and devastated the entire town. I’d like to highlight a couple of stories so that after this week of tragedy we can all be uplifted by the heroism of our fellow Americans. In Boston, runners who had just completed 26 miles kept running another few miles more to donate blood at local hospitals. Volunteers for the Boston Athletic Association, who were there to keep the race organized and provide water, bandages, and other minor first aid at the finish line, rushed to help staunch bleeding from traumatic wounds and get victims to the hospital. An active duty soldier, running to raise money for a veterans’ group, tore his shirt off to use as a tourniquet on a wounded man. In West, when the fire broke out at the fertilizer plant, volunteer firefighters rushed to the scene. One of the fallen first responders was Kenny Harris, a resident of West. He was a firefighter in Dallas, and although he was off-duty, when he heard about the blaze he rushed to help. The potential dangers of the situation weren’t lost on any of these firefighters—but because they knew the dangers, they worked that much harder to extinguish the fire. It’s incredible to me that when people were faced with fire, explosives, and chaos, they had the courage and presence of mind to run toward that danger. These heroic first responders are what make our nation great. America will never be defined by terrorism, or by tragedy. Instead, America will remain the land of the free and home of the brave because of courageous acts like these. God bless you, God bless these brave men and women, and may God continue to bless these United States of America.